Jennifer Boyd was an NHS district nurse for 13 years when she decided she wanted a new challenge. 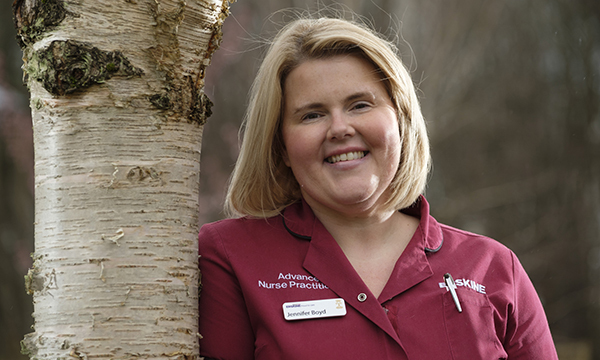 In 2014 she became a care home liaison nurse and, as part of her new role, spent some time at Erskine, a Scottish provider of care for veterans and their spouses. She says: ‘In April 2016, a post came up with Erskine for a house manager. I applied and was successful. About five months later the director of care approached me to see if I would be interested in advanced practice. Her course is being funded by the chief nursing officer’s directorate through NHS Education for Scotland and she is one of the first ANPs in the UK to be employed by a care home. Ms Boyd says that Erskine has the lowest hospital admission rates of all the care homes across Renfrewshire. She believes this is due to the upskilling of staff on the importance of knowing the difference between appropriate and inappropriate admissions. ‘We use an SBAR form, which we created with NHS 24. It stands for situation, background, assessment and recommendation. 'We use it as a prompt when we need to call NHS 24. Staff need to think what is happening now, what were the circumstances leading up to the call, what their assessment of the resident is, and what they think needs to happen. ‘The form includes observations of the patient and if they have an anticipatory care plan. Staff are also asked to have residents’ notes to hand if possible. ‘Additionally, we have worked with Information Services Division Scotland. We now complete a form before the resident sees a GP so they are getting more information prior to the consultation. Ms Boyd works with 220 residents and liaises with 62 registered nurses, house managers and the home manager. ‘When I was working in district nursing I was intrinsically part of older people’s nursing,' she says. 'For me it feels like a privilege working with older people and not a chore. 'There is satisfaction in making a difference in people’s lives. At Erskine, the residents are encouraged to personalise their rooms, for example, by using their own furniture. ‘We have a chance to step into their lives and see who they were before they came in. They all have such incredible stories about serving in the forces,' says Ms Boyd. ‘There is an activities team and we have events such as concerts. The residents also go out quite often. If one said they wanted to go out, nurses would work with other staff to facilitate that. It might be as simple as having a fish and chip supper, going to the pub or even fishing. Recreational facilities provide a programme of activities that changes on a weekly basis and is put together based on suggestions from the veterans. Popular activities include IT, genealogy, woodwork, model making and art. Veterans who are not living in the homes are also able to attend drop-in sessions. Despite all the improvements in care homes, Ms Boyd thinks there is a lot of stigma about working in the sector. ‘I had former colleagues who were bewildered about why I would leave the NHS to go to the third sector,' she says. 'However, once they see Erskine they realise we do things a bit differently and I have had many chances that would not have been available if I had stayed in the NHS. ‘All our medication systems and care plans are online, and we are moving to e-rostering. We get a lot of continuing professional development and trainers will come in if there’s something we are not familiar with. A dementia nurse consultant role was established at Erskine two years ago and the nurse consultant is working with all the staff so they have dementia training. There is a cottage on site specifically set up for simulated dementia training. 'We put on weighted suits to show us the effects of frailty,’ explains Ms Boyd. 'We then try to do seemingly simple tasks such as putting the washing out. We are filmed doing the tasks and watching it back can be quite emotional because you really get a sense of what it must be like for residents. She has also made staff aware of the vital need for sepsis knowledge and has displayed posters around the homes describing red flags. Ms Boyd says: 'About 90% of residents don’t want to go into hospital. Since we’ve started the sepsis awareness we have had two cases that we recognised quickly and they were back home from hospital within three days. In January this year Scottish government health secretary Shona Robison visited Erskine, and met with residents and staff to hear about some of the innovative nursing practices at the charity, including Ms Boyd’s role. Ms Boyd is receiving practical training on surgical care as part of her MSc and hopes to use her prescribing qualification, which she obtained in 2012, in the future. After the First World War, there were insufficient hospital facilities to care for those wounded in battle and the first Erskine hospital, the Princess Louise Scottish Hospital for Limbless Sailors and Soldiers, was opened in 1916. The charity needs £10 million a year to support veterans and has cared for more than 85,000 people since its inception. It has four care homes in Scotland: two in Bishopton, one in Glasgow and one in Edinburgh. The charity also has 44 cottages on the Erskine Estate in Bishopton for veterans and their families, and has just announced plans to build 24 single-living apartments on the estate for veterans of working age. 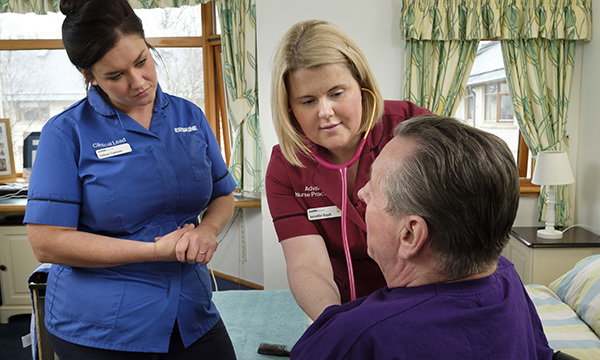 Erskine facilitates nursing students across its four care homes during their training. About 30 students a year are supported and mentored by 80 of the charity’s registered nurses.